Why not spruce up a concrete patio by designing and building a wood deck on it? Options include multi-level deck sections, built-in seating, storage spaces, and hand rails for safety. This is a great DIY project for those who are inclined to save money by lowered labor costs. If the existing concrete patio is serviceable and reasonably level the project requires minimum preparation. A wood deck is a worthy alternative to finishing a patio with either ceramic or porcelain tile. Home improvement stores usually stock concrete bell-bottom supports. Theyre made with brackets attached to them. The bracket accepts the decks beams. Its easy to lay them out on the patio according to a beam spacing formula. The first thing to do is to visualize the initial deck design. Next, get out pencil and paper and figure out the lumber size and spacing. Theres a link to the math formulas for this at the bottom of this article. Use composite or pressure-treated wood. Take time to choose only the truest stock. This article explains the most efficient method of installing a deck on a patio. But for those not wishing to perform the actual labor, I highly recommend Angies List - Where thousands of consumers share their ratings on the local contractors and service companies they hire. Learn more. . This makes much more sense than playing yellow pages roulette. Many backyard designs work well with a larger deck than the existing cement patio. This option simply requires a bit more labor and materials. In for a dime, in for a dollar, as the saying goes. This requires 4 X 4 post footings and securing joist brackets to them. Be sure to use hardware with a coating appropriate to the chemicals your lumber is coated with. When digging post hole footings, excavate in a direct line with the bell-bottom supports on the concrete patio. Use a string line for an accurate line and height. Use caution not to cut any buried telephone, cable lines, or utilities. The responsible companies will assist in locating them. A minimum of 1 bag of concrete for each post. 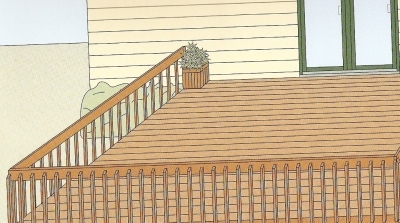 They should be level with the supports laid out on the patio or raised if the deck design is multi-level. It is critical to get the post layout square. The 3-4-5 method works fine for this. Keep in mind that how deep your posts go depends on where you live. In colder areas, you must go below the frost line. Check your local building codes for more info. By now the concrete footings are all laid out in their places. Some people simply set them on the patio surface. Its a better idea to mark their locations with chalk and secure them with an exterior-grade adhesive. Next, set in the beams and secure them to the brackets. As mentioned above, only use pressure-treated lumber or a composite material thats designed for decks. Next install the deck joists. They run perpendicular to the beams. After all the joists are installed and cut to length, its time to cut and nail down the decking. Use caution not to set them too close together. Allow approximately 1/4 or whatever tolerance the manufacturer recommends between each board. This will allow air flow and an avenue for water to drain. Once the basic deck construction is done, why not consider some options? Handrails are a good idea for enhancing safety and giving it a more professional and 3-dimensional look. Consider building benches around the perimeter. These can be simple, minimalist benches or models that have hinged seats that allow for valuable storage space. The last task is to protect the new deck from the elements. This is done by sealing it. Dont do this immediately if pressure-treated wood was used. It usually needs time to dry out. A popular option is to apply a sealer that incorporates a stain. The deck should be re-sealed periodically but the time interval is dependent on location, materials, and finish used. Whats left? A barbecue pit and a cold beer!